This Tigerino Nuggies clumping cat litter has a lovely fresh cotton scent. It is made 100% natural clay and smells of freshly washed laundry. It is especially fine-grained and low in dust. It has an Aroma Control Formula which effectively locks nasty odours in and releases the fresh laundry fragrance. All this helps to make life more pleasant for pets and their owners. Tigerino Nuggies clumping cat litter at a glance: Pleasant fresh cotton scent 100% natural clay Free from chemical additives Clumps instantly Extremely absorbent - 4 x more efficient that traditional litter Keeps odours locked in Fine grains, low in dust Tip: It is a good idea to keep the litter tray in a warm, dry room. 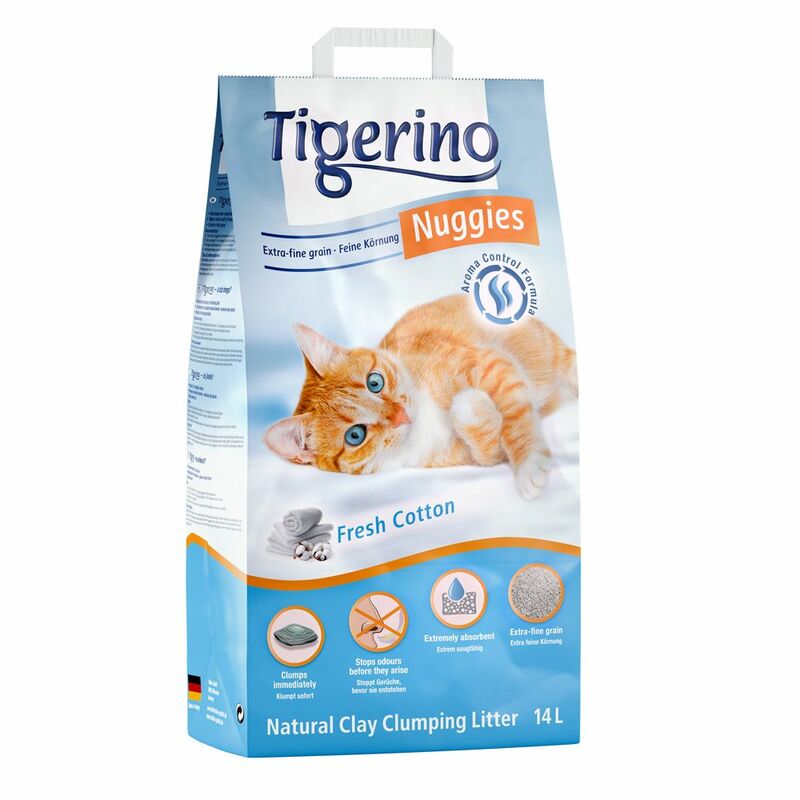 The soiled Tigerino Nuggies cat litter forms quickly into firm clumps which helps to keep the remaining litter clean and dry. Regular removal of clumped litter with a litter scoop will help to keep the rest of the litter fresh and hygienic. In very rare instances your cat might not take to Tigerino immediately. You can mix Tigerino Nuggies with your old litter, but this can influence the effectiveneΒ. Instructions for use: Fill the clean cat litter tray with approx. 7cm of Tigerino Nuggies clumping litter. Remove soiled clumps and faeces at least once a day. Add additional litter if neceΒary. Clean the litter tray approx. once a month. Dispose of soiled litter with your household waste or according to your local regulations for disposal of large amounts of cat litter. Never dispose of Tigerino Nuggies in the toilet.